Home / BatangasEssay / Lifestyle / Are Baraco and Batangas Coffee the Same? Are Baraco and Batangas Coffee the Same? I just spent the morning with Omar Mercado, a former student of mine whose family owns the company Café de Lipa. I did not meet up with him to talk coffee; but when you are with a coffee man, you inevitably end up talking about coffee. In all fairness, it was because I was the one who raised all the coffee questions. The one question that I really wanted answered may sound strange knowing as all who frequent this site do that I was Batangas born and bred. I asked Omar if Batangas coffee and baraco are one and the same. That may sound like the mother of all stupid questions; but in fact, as Omar’s subsequent answer showed, it is anything but. In fact, Batangas coffee and baraco are not the same. First of all, I learned that there is this growing trend among coffee producers – not the planters – to label their products geographically as a way of being truthful to the coffee connoisseurs. This is because one variety of coffee planted in one place will not taste the same as that planted in another place. Not at all, he told me. The coffee is no longer grown to the same extent as it used to be; but there are still enough plantations around the province to keep Batangas deserving of its association with the name baraco. It can be due to the soil, the environment, perhaps the amount of rainfall or any of the countless other factors that graduates of Agriculture will know all about. At the end of the day, those with discriminating palates will know which coffee was grown in Indonesia and which was grown in Brazil. 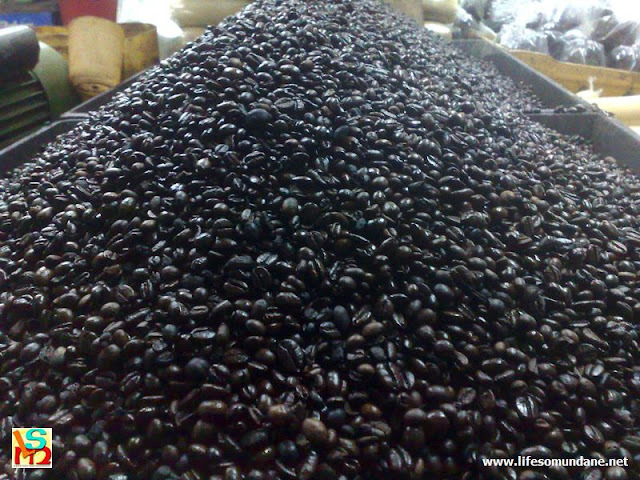 Batangas coffee, therefore, tells the consumer that the coffee was grown in Batangas. It is an example of geographical labeling to aid the discriminating coffee drinker. Baraco, meanwhile, is primarily of the variety of coffee known as Coffea Liberica or Liberian coffee. This part did not come from Omar but what the heck; for things that I forget to ask about, there is always Wikipedia. Liberica and robusta are supposed to taste alike and are what is known as baraco. Don’t take my word for this, however. At any rate, to get back to the gist of the matter, baraco will be baraco whether it is grown in Batangas, Cavite or elsewhere. But baraco grown in Cavite will, as per the protocols of geographic labeling, naturally not be Batangas coffee. To make a long story short, Batangas coffee is baraco; but as grown in Batangas and nowhere else. Then again, don’t quote me on this because Omar was spewing off more information than my rusty old brain could keep up with. I did hear it alleged somewhere that although Batangas and baraco are close to being synonymous, ironically more of the coffee is being grown in the neighbouring province of Cavite. Naturally, I wanted to know from Omar if this was true. The final point of this short essay has nothing at all to do with either Batangas or baraco. I asked Omar if his company sold kopi luwak. For those whose interest in coffee has not gone beyond the cursory, the story of the kopi luwak is worth a second glance. I first heard about this from an NGC feature on the Asian palm civet, a variety of cat residing in the Indonesian jungles. In its natural habitat, the civet chooses the ripest coffee beans and eats these. By some biological mystery, the civet’s stomach digests only the outer skin of the coffee beans. The rest is poo-pooed onto the ground, picked up by the farmers, cleaned, subsequently roasted, ground and later served to a coffee aficionado somewhere. And very expensive, this coffee from cat poop. No, Café de Lipa doesn’t sell kopi luwak as a company stand against cruelty to animals. There are, apparently, those in this country who keep civet cats in captivity and force feed them coffee beans just so they can excrete the precious cores. Omar did tell me that he wouldn’t mind the kopi luwak if these were from Malarayat where the farmers would pick up the excreted cores from the ground as was the natural way. So there, my friends. I learned something new again today. I used to think that the civet cats were unique to the Indonesian archipelago. I never would have thought that we have them right here in Lipa. Then, of course, I finally learned that Batangas coffee and baraco are not the same. Imagine that.